Your Content, good, bad or ugly: Can you measure it? I just wrote a post on Social Media & Web Content in which the gist was, no matter the forum that’s selected to write in, your content must be good. The phrase Content is King still stands whether you are blogging, using Facebook or providing content for your website. The goal, after all is to allow an open door for conversation to happen. If conversation is NOT happening with your followers or about your content, Your Content IS NOT KING. Providing good content can be addressed, but that is indeed another blog post that will happen at another time. So, How do you know the effectiveness of your content? How do you gauge what is good and what is not so good? How can you place a tangible number or analytic on the effectiveness of your content? It’s not as if one of your readers will walk up to you and say ” Hey Anise..guess what that last story you posted on The Semantic Web really sucked..what the heck were you really talking about…and guess what Anise..I really don’t care about The Semantic Web..” Not to say that I would exactly like my content slammed like that, however that would give an indication that I was just a tad off my mark. Ya’ Think? Social Media, Blogging and providing content is an essential part of any business now, so we have to know if we are on target with our audience. Yes we have insights for Facebook, Post counts for blogs and analytics for websites but how about an indication of the effectiveness of your entire social media presence? Umm Yes, there’s an App for that, better yet there’s a game for that. Empire Avenue. Empire Avenue is a game that allows you to purchase shares in your friends, competitor’s, frienemies and foes. Most importantly it gives you and ongoing indication of your effectiveness in your social media efforts. Empire Avenue allows you to sign up, and then attach all of your social media channels to the game and you are given an initial score or rating based on your connections. These scores and ratings fluctuate according to social media activity and that is reflected in your share price or the price that it would cost for someone to purchase a share in you or your company. Yes like stock. The very HUGE tie in is YOUR CONTENT. If you are seriously on your social media game and YOUR CONTENT IS KING, your Dividends will be high, which means people will want to buy your shares because they will make Eaves or Virtual Money. This leads to more purchases of your shares, which continues to drive your share price up. 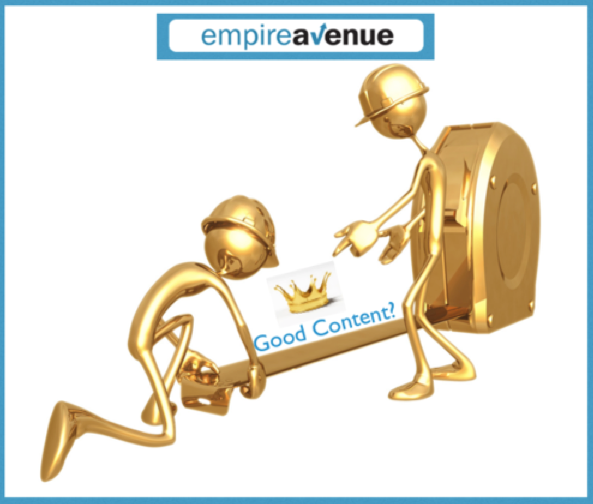 The big picture is that Empire Avenue allows you to gauge the effectiveness of your content by placing a dollar amount on your dividends. If your content is effective your dividends go up, if you need to work a bit harder on your content, you dividends will go down. For example, if your dividends are $1.00 per share your Content is King; however, if your dividends are $0.12 you know that you need to continue to work toward improvement. If you choose to play the game, let me know your ticker I will buy your shares. 🙂 Better yet, sign up using this link and you will get $$ to play with, I will too! Cha-ching baby! With that said, I always welcome comments, good, bad, ugly or indifferent. So feel free to comment here or directly on my Facebook Wall.